SME Model 15A review | What Hi-Fi? SME has quite some pedigree. It was founded in 1946 and originally known as the Scale Model Equipment Company. As the name implies, the company designed and manufactured intricate models for the exhibition and model engineering trade. It then expanded into producing precision aircraft parts for the likes of Rolls-Royce and Hawker. Even today, a large part of the business involves precision engineering for the medical, automotive, Formula 1 and aerospace industries. This is no ordinary hi-fi company. Take the Model 15A out of its wooden crate and there’s no mistaking that fact. If you’re the kind of person that loves engineering, you’ll love this deck. We can’t remember testing a turntable so well made or finished. The styling and ‘black with more black’ finish won’t appeal to all, but there’s no denying the hewn-from-solid feel to the build. Or the feeling this is something that will still be working for your grandchildren. It’s mighty heavy for such a compact unit, too, weighing in at almost 20kg. Technically, there’s a lot going on here. The Model 15 is a suspended deck, but not by conventional methods. It uses 30 moulded rubber O-rings, combined with a central fluid-filled damper to help control the motion of the subchassis. Together with the platter, the subchassis weighs in at a hefty 11kg. The design is highly effective, with the deck barely registering the footfalls that made Linn’s suspended LP12 jump grooves when playing. The platter is no ordinary affair, either. It’s a 5kg piece of highly machined aluminium alloy lined with damping material on the top (where the record sits). The damping material is then diamond-turned to create a surface covered with fine fibres to support the record. A lovely-to-handle record clamp forces the vinyl down onto the platter, flattening any (slight) warping in the process. The platter spins smoothly thanks to a 19mm high-chrome tool-steel spindle sitting in a sealed housing lined with sintered bronze bearings. VIDEO: Are these the best-engineered record players you can buy? The motor – this deck is belt-driven – is isolated from the main turntable structure by urethane mounts, while speed is controlled by an outboard power supply. The Model 15 can run at 33 1/3, 45 or 78RPM at the simple press of a dedicated button, and SME even supply a suitable strobe mat to check absolute speed accuracy. If for some reason the deck isn’t running exactly to speed, it’s easily adjustable. It just takes a few button presses. 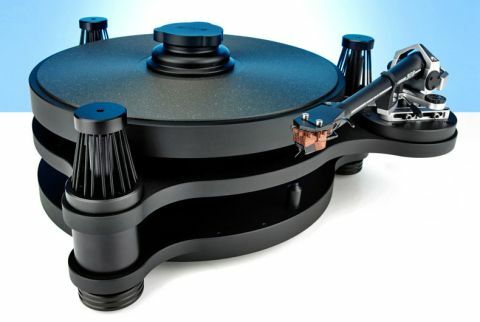 Most Model 15s will be fitted with one of the company’s highly regarded tonearms. While the deck is happy to accommodate a variety of tonearms, it feels unduly wilful to overlook the hugely capable in-house choices. The ‘A’ in the product name means our sample comes with the 309 arm – it has a detachable headshell that makes cartridge-swapping a breeze. It may not be the best-performing arm the company makes (that honour is held by either the IV or V, depending on your sonic priorities), but it’s still a lovely thing. Like most high-end decks, this SME needs assembling. While we would expect the supplying dealer to do this, the included instructions are detailed enough to make it a relatively simple affair. Throughout, we’re impressed by the way the parts fit together and by the practicality of the design. We particularly like the adjustability on the arm - it makes it so easy to get the cartridge alignment spot-on. SME, thoughtfully, includes pretty much all the gauges and tools needed to get everything just so. If only other manufacturers were so user-friendly. Our usual advice with turntables is to place them well away from speakers and on a rigid, level, low-resonance support. While the combination of well-designed suspension and high mass makes this Model 15A less sensitive than most of its competition, this advice still holds if you want best performance. SME doesn’t make its own cartridges, and our review sample is supplied with a Clearaudio Concerto V2. This is a sensibly designed moving-coil cartridge, with an unusually shaped wooden body and boron cantilever. We set the tracking weight on the 309 tonearm to the recommended 2.8g and, despite some experimentation, left it there throughout our listening. By high-end standards this cartridge’s £2000 price tag isn’t too outlandish. Once up and running, there’s plenty to admire about the Model 15A’s performance. We start off with Beethoven’s Fifth Symphony and the record player sounds right at home. Its presentation can be summarised in just two words: authority and control. We can’t think of a rival that sounds so composed, or one that delivers the demanding dynamics of this classical piece in such an unflustered manner. There’s huge scale to the presentation, the various parts of the orchestra arranged with painstaking precision. The stereo image may be both wide and deep, but it’s stable - even when the piece becomes almost ungovernably demanding. That Clearaudio cartridge is a good choice - our reference Clearaudio Innovation Wood package uses the closely related Stradivari V2, and the two share much in the way of balanced tonality, pleasing resolution and generally well balanced character. We’re soon caught up in the music, savouring the Model 15A’s assured way with large-scale dynamics, the sense of power imparted and its ability to allow individual instrumental strands to breathe freely without sacrificing the cohesion of the piece. We switch to Nick Cave And The Bad Seed’s The Boatman’s Call and some of the SME’s other characteristics become apparent. It digs up plenty of detail, delivering Cave’s rugged vocals with real skill and solidity. Nuances aren’t overlooked, and the ability to tie all that information together to produce a convincing whole is apparent once again. But it’s not all positive news. That sense of control we so enjoyed with the Beethoven piece is a little overcooked here. It’s as if the SME never quite lets the music break free, preferring to keep it in a cast-iron grip. This effect is even more obvious when we play Nirvana’s Nevermind. Here the sound is packed with power, punch and precision, yet the hard-charging rhythmic drive is never quite delivered with the verve we’d expect, nor is Kurt Cobain’s voice rendered with enough bite. The result is a sound that’s packed with information, organised with OCD levels of neatness, but also one that fails to involve us in the way we know ought. We’re left being impressed by the SME’s undeniable talents, but also a little cold by the aloof nature of its sound. While we believe the excitement in music should come from the music itself rather than the kit, we feel the Model 15A misses out on the low-level dynamic expression and rhythmic dexterity needed for edgier genres of music. Don’t get us wrong. In many ways this SME is one of the most impressive products we’ve had in our rooms in years. There’s no questioning the build or engineering - it really is second-to-none in these respects. Having visited the factory, we can testify to the care taken in getting every nut and bolt of this deck made to the highest standards. In the sound, too, there is so much to admire. Yet the sense of control and authority we so liked with the large-scale classical music overplays its hand with other genres. For us, it leaves the Model 15A combination as something we can admire endlessly, but never quite fall all the way in love with.